With polls showing that a majority of the public is war-weary and supports cutting defense spending, the peace movement finds itself in a rare moment of opportunity. 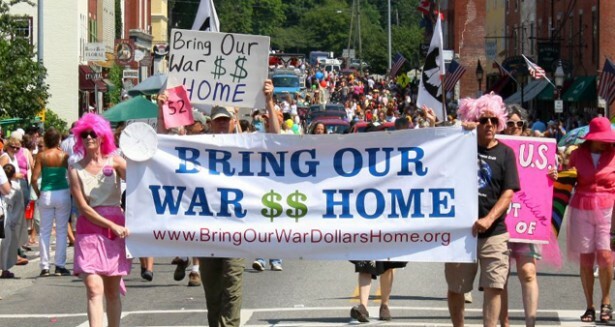 With polls showing that a majority of the public is war-weary and that there is growing support for cutting military spending, the peace movement finds itself in a rare moment of opportunity. Concentrating efforts on building broad coalitions, there is a renewed energy among peace and economic justice groups to radically influence the Pentagon’s budget, which has more than doubled since 2001. “This is the biggest opening, created by the grand realization of the cost of war, in 50 years” to cut wasteful military spending and change the government’s fiscal priorities in this age of economic austerity measures, said longtime organizer Judith LeBlanc from Peace Action, a grassroots peace network with affiliates across the country. Currently, the Department of Defense’s budget accounts for over half of all federal discretionary spending. In 2013, the Pentagon cost U.S. taxpayers $530 billion — excluding the costs of war, both past and present, nuclear programs and many other national security expenses. When the White House released its 2014 budget proposal with a Department of Defense budget of $526 billion, the nonpartisan research organization National Priorities Project showed that military spending is only 1.6 percent less than 2013. But the real costs are much higher. According to an analysis from the War Resisters’ League — the nation’s oldest secular pacifist organization — total defense-related spending, including veterans’ benefits and interest accrued on past military spending, will be close to $1.35 trillion in 2013 alone. This analysis is in line with the conclusions of prominent economists Linda Bilmes and Joseph Stiglitz, who have estimated the U.S. costs of the Iraq and Afghanistan wars will total between four and six trillion dollars. Speaking with Miriam Pemberton at the Institute for Policy Studies, it becomes clear that — for many — the support for cutting defense spending is more out of economic necessity than any kind of ideological anti-militarism. According to Pemberton, it was the Bush administration’s — and now Obama’s — forays into Afghanistan and Iraq that contributed to the United States’ ballooning national debt and the neglecting of domestic needs. A key term in such a transition is economic conversion, as is modeled in Peace Action’s and the National Priorities Project’s “Move the Money” campaign. The idea is to provide training and curriculum for a different economic base for communities that are dependent on military spending. Ten Peace Action affiliates are using the model to build broader coalitions in their own communities. Furthermore, Peace Action has been instrumental in building strategic alliances among a wide range of groups working for social change, including economic, racial and environmental justice organizations. In January 2013, more than 118 national groups signed a letter, which was sent to members of Congress, demanding that the government cut wasteful spending from the Pentagon budget. The groups endorsing the call to “shift from spending on outdated, unnecessary weapons to investments in projects that keep us secure and help us prosper — first responders, teachers, bridges, roads, and rails” included U.S. Labor Against the War, Jobs with Justice, Sierra Club, NAACP, SEIU and the Children’s Defense Fund. The critique of bloated military spending has unified peace organizations that have typically been focused on foreign policy and the community-based groups that have traditionally organized around domestic needs. Leading the way is the New Priorities Network, which was founded in the wake of the One Nation Working Together rally, which drew tens of thousands of people to Washington, D.C., in 2010. One organizer, Christine Ahn, explained that the march culminated in a resolution, supported by many of the different progressive organizations, to call for drastically reduced military spending. “The day after the march, peace and economic justice groups met to discuss how to coordinate national efforts to move the money from war spending to community needs,” she wrote in War Times. According to Michael Prokosch, one of the main coordinators for New Priorities Network, broad-based organizing is necessary to go up against one of the most powerful, entrenched forces in U.S. society — the military industrial complex. What makes this kind of practical anti-war organizing possible is the understanding that people need jobs and that the money currently being spent on war would create far more jobs were it to be redirected toward meeting domestic needs, like education and health care. The Pentagon is already starting to tighten its fiscal belt. In fact, Secretary of Defense Chuck Hagel is taking a 14-day pay cut to be in solidarity with the hundreds of thousands of civilian employees who are forced to take unpaid furloughs. The Associated Press reports that Hagel’s “blueprint calls for another round of domestic base closures, higher health care fees for retirees and their dependents, and a smaller pay raise for personnel.” While the United States maintains more than 1,000 military bases in over 130 countries, the Pentagon is placing the burden of cuts on people instead of the companies that manufacture weapons systems, like the much-criticized F-35 Joint Strike Fighter. At an average price tag of $137 million a piece, Lockheed Martin has made a killing on the $400 billion spent by the Pentagon on its most expensive weapons program. It is estimated that the total cost of building and maintaining the program is $1.5 trillion — more than the entire cost of the sequestration. The exorbinant F-35 program was one of the targets on the Global Day of Action on Military Spending, which coincided with Tax Day in the United States and the release of the Stockholm International Peace Research Institute’s annual report on world military expenditures. The American Friends Service Committee has been involved in antiwar work since its inception during World War I. The group is one of the key organizations developing resources to aid activists in pressuring Congress to drop the $8.5 billion the Pentagon hopes to spend on the F-35 in 2014. Zerkel acknowledges that shutting down the F-35 program is low-hanging fruit that, quite likely, could be included in the 2014 NDAA bill to be authored in May. Still it would represent a significant victory for the merging peace and economic justice movements that have made funding humans needs — not the Pentagon — an attractive and realistic plausibility. In April, Zerkel shepherded 65 youth from around the country to Washington, D.C., for leadership and lobby training, which was a part of the “If I Had a Trillion Dollars” youth film festival. A joint project between AFSC and the National Priorities Project, the festival is a powerful expression of what youth in the United States think the federal budget should prioritize. In recent years, AFSC has made an effort not to silo its different initiatives. “We realized we couldn’t possibly [cut military spending] just as a bunch of white peace groups. We really need to work with other people, understand what their struggles are, and incorporate it into the way that we are moving forward,” Zerkel told Waging Nonviolence. In 2008, AFSC expanded from focusing solely on the human cost of war — which it had demonstrated with the Eyes Wide Open campaign — to include the economic cost of war. Mary Zerkel, from AFSC, clarified the following about the F-35 program: that there likely will be an amendment as part of the upcoming NDAA process (which is now in June) – but it will focus on slowing procurement. we are looking at this as a first step and unlikely to succeed but a chance to begin to garner support for stopping the program in the next budget cycle starting in Jan.
the millions of dollars always seem to go into the wrong hands.how are we the people surpose to inforce the government to give to the programs that really are in ned of the finance needed to get the proper shelter the housing how are the schools funded now the lotto makes more than enough to surport every aspect especially the job market maybe the unemployement rate would not be so high. thank you.